How is it the Committee People have already endorsed Slay for mayor even though filing has not ended and you have not had an endorsment meeting? You may have seen a list of endorsements on mayorslay.com that included Gregg and me. Our names were listed in error and we have asked for them to be removed which they have been. We strongly believe in the open ward organization system and the importance of all members having an equal vote in the candidate endorsements the organization makes. We do not make endorsements on our own prior to the organization's endorsement meeting. 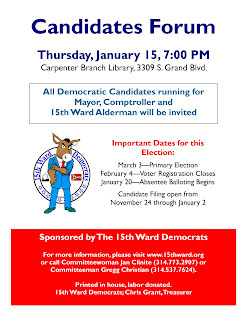 As president of the 15th Ward Democrats, I was also very concerned by the listing of Jan and Gregg among the Mayor's list of endorsements. I was happy to learn that Jan had already contacted the campaign to correct the error before I addressed the issue. The ward organization's endorsement will be determined by a vote of its eligible members and all members will have a voice at the endorsement meeting. I am glad to report that as a result of Jan and Gregg's election, increased outreach and campaign activity for the November election, the organization has welcomed many new active members. Is alderwoman Florida going to request her name be withdrawn or has she already made an official endorsement? I have not spoken with Alderwoman Florida about her endorsement plans this election. She has sometimes endorsed independently or differently than the 15th Ward Democrats in past races. Her endorsements are personal endorsements as Alderwoman and do not necessarily reflect the endorsements of the 15th Ward Democrats. She hold's a board position with the ward organization. I position I believe that must be approved by the other board members. The alderperson holds an executive officer position in the group. I think there are 8 executive officers in total. Importantly, the entire membership votes on whether to include the alderperson as an executive officer, not simply the other board members. To repeat what Jan said above, the group and the alderperson have in the past supported different candidates, and historically the group gives collective support to its endorsed candidate even if the alderperson (or any other member for that matter) is supporting someone else. That is the nature of the group. I would welcome Anonymous (and anyone else in the 15th Ward who is interested in local politics) to join the group, to voice his or her own opinion on whom the group should endorse, and then participate in the group's activities. That is the great thing about an open ward organization. I, for one, am looking forward to a good debate on the candidates at our upcoming endorsement meeting.